Dr. Terry Pearson, Superintendent for Wetaskiwin Regional Public Schools, presents the Governor General's Medallion to Hanna Jevne. 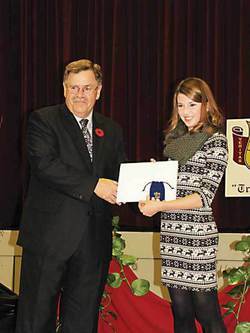 The Wetaskiwin Composite High School Awards Night saw nearly 90 individual awards presented to nearly 60 students. The Rutherford Scholarships were earned by 25 students, with eight of those students present to receive the accompanying certificate and five parents there to represent their son or daughter. The Rutherford Scholarships are awarded to graduates who are continuing on to post-secondary education and include amounts for excellence in Grades 10 and 11 as well as in Grade 12. Every year, there is one outstanding student whose academic excellence merits multiple awards. This year that outstanding student is Hanna Jevne. She received the Academic Awards for English 30-1, French Second Language 30, Social 30-1, and Chemistry 30 as well as the Academic Honours Pin for Grade 12, the Governor General's Medallion, and, of course, a Rutherford Scholarship. In addition, she received the Modern Languages Scholarship, the Loyal Order of the Moose Social Studies Scholarship, the Fritz Brockman Memorial Scholarship for Excellence in Chemistry, and the Lawyers of Wetaskiwin Award, 11 awards in all. Congratulations, Hanna! There were other students also earning multiple awards, most of them for academic excellence. Emily Maplethorpe and Colton Hok both received five awards, while Brooke Gusse and Madison Ouellette received four, Brett Coutney, Jessica Dinner, Marissa Graham, and Joanna Villegas received three, and two went to Megan Lethbridge, Robyn Hebert, Justin Hodgson, Marcus Jackson, and Leah Sieg. Congratulations to all of these outstanding students. Courtney Cook also received two awards, one for Biology 30, which she took while still in Grade 11 and excelled in, and the Grade 11 Academic Honours Pin. Besides awards for academic excellence, there are also awards presented for excellence in specific areas such as mechanics, music, drama, or athletics. Awards are also given for excellence in progress, effort, and/or attitude in some special programs. The Principal of WCHS, Mrs. Looker, ended the ceremony with appreciation to all who had helped to organize the evening, to Mrs. Johnson and her Food 30 students for the delicious cookies to accompany coffee afterwards, and to the strong families and strong community which supported these talented students in reaching their success. It is always wonderful to see such meaningful celebration of excellence in success. Congratulations to all!